Drew Estate has begun to ship its Herrera Esteli Miami line exclusively to its Drew Diplomat Retailers nationwide. 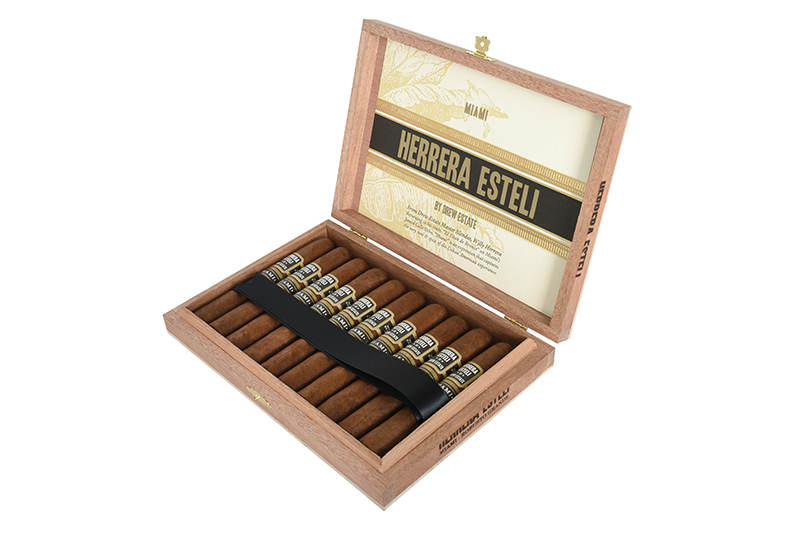 Handmade at El Titan de Bronze on Calle Ocho in Little Havana, the Herrera Esteli Miami is crafted by Level 9 Cuban Rollers. The cigar features a lavish Ecuadorian Habano Oscuro wrapper, an Ecuadorian Sumatran binder and select fillers from the Dominican Republic and Nicaragua. This new release also features the updated cigar band and branding for Herrera Esteli line as revealed earlier in the year. The cigar will be available in five vitolas: Robusto Grande (5 x 50), Toro Especial (6 x 52), Lonsdale Deluxe (6 1/2 x 44), Piramide Fino (6 1/2 x 54), Corona Gorda (5 3/4 x 48). The cigars will come packaged in 10-count boxes and will have an MSRP that ranges between $97.97 and $127.47. “The amount of pride I feel unveiling the full Herrera Esteli Miami line to our most valued retailers is immense. Getting to spend so much time in my family’s factory, El Titan de Bronze, I was able to personally supervise every step of the process to make sure the Miami’s are smoking excellently. I know, I smoked a ton of them,” said Willy Herrera, Drew Estate’s master blender.